The first NASCAR Sprint Cup race of the 2012 season held on a track under a mile in length, the 0.533-mile Bristol Motor Speedway served as the stage of 43 cars competing for the Food City 500. A Sunday event offering a scheduled course of 500 laps, the Food City 500 in Bristol, Tennessee started with race’s pole sitter Roush Fenway Racing #16 Ford driver Greg Biffle taking the outside line for the start. A decision occasionally exercised by the pole sitter or race leader on coming to a green flag, Greg Biffle’s choice for the outside line was very much allowed in the NASCAR Sprint Cup rulebook. Since a dramatic resurfacing of the Bristol short track was performed in 2007, variable banking meant that competitors could chose various fast lines around the oval. For Biffle, taking the green flag on the outside lane for the start of the Food City 500 worked flawlessly in establishing the #16 Ford Fusion as the early favourite at Bristol. Leading the first 41 laps, the Food City 500 pace early was important to Greg Biffle’s presence at the top of the 2012 NASCAR Sprint Cup Series Driver’s standings. With rain washing off the Bristol Motor Speedway surface the night before the afternoon event, NASCAR was prepared to throw a competition caution in order to help teams adjust to the altered racing conditions. Set for lap 50, there would be no need for the scheduled yellow flag. Initialized with contact between the #5 Farmers Insurance Chevrolet of Kasey Kahne and the #78 Furniture Row Chevrolet through the track‘s frontstretch, the resulting pile-up swept up some front-running mainstays early in the Food City 500. 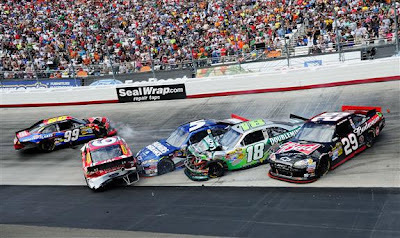 The #99 Ford of Carl Edwards, Kyle Busch’s #18 Joe Gibbs Racing Toyota, the #9 Ford of Marcos Ambrose and Kevin Harvick’s #29 Chevrolet all sustained some form of noticeable damage from a multi-car tangle in turn 1. Under the yellow flag for 22 laps, there was a considerable time during the Food City 500 for all cars to adjust and repair their stock car. Despite the early carnage, NASCAR Sprint Cup team members thrashed away at the damage race vehicles eventually returning every car involved in the lap 24 crash. While cars like the #29 Richard Childress Racing-owned #29 Chevrolet of Kevin Harvick were serviced on pit road, the race vehicles of Kyle Busch and Carl Edwards required extensive work behind the wall that would trap both drivers down multiple laps for the event. During the pit stop cycle where the NASCAR Sprint Cup competitors, the Penske Racing #22 Dodge piloted by AJ Allmendinger stayed on the race track becoming the new leader of the Food City 500 at Bristol Motor Speedway. Despite being challenged by cars with better tires, Allmendinger held on to the race’s top spot for an impressive 54 laps. However, after Allmendinger was passed by a Michael Waltrip Racing-owned #55 Toyota, the #22 Shell/Pennzoil Dodge Charger would become more of a handful for the driver over the course of the short track event. Never regaining the lead, AJ Allmendinger’s struggle into the later stages of the race ended with a 17th place finish two laps down. Taking the lead on lap 118, the #55 Toyota Camry (driven by Mark Martin during the first three races as part of his limited schedule on the 2012 NASCAR Sprint Cup schedule), Brian Vickers was wheeling the Michael Waltrip Racing stock car. Left without a ride after the 2011 when Team Red Bull Racing exited the NASCAR Sprint Cup Series, Vickers’ 2012 debut at Bristol was a one chance to showcase his driving talent during the young tour. Leading three times for a total of 125 laps, Brian Vickers definitely sent a clear message that the two-time Sprint Cup Series race winning driver was determined and talented enough for more events. Along with Vickers’, the Michael Waltrip Racing team surrounding the part-time driver also showed off some fantastic talent through the Bristol Motor Speedway race. The team’s #56 NAPA Toyota driven by Martin Truex Jr did not lead a lap at in the Food City 500 by hung around the front pack throughout the event to finish third at Bristol. Behind Truex Jr, Clint Bowyer would finish the Food City 500 a strong 4th after several hiccups in the 2012 season to date. Leading so many laps through the mid-stage of NASCAR Sprint Cup Series event, Brian Vickers ended the 500-lap race in 5th place. 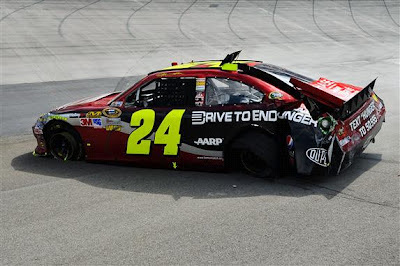 With only five cautions breaking up an otherwise rather tame Bristol short track event, only the lap 24 caution resulted in several cars being victimized by a single mishap on-track. Other notable caution in the Food City 500 came on lap 361 through the interaction between two Hendrick Motorsports teammates. Running side-by-side down the backstretch, the #88 of Dale Earnhardt Jr and Jeff Gordon’s #24 Chevrolet touched each other gently on the side panels. Looking like innocent contact for an instant, the impact would cut-down Gordon’s left rear tire causing the #24 Chevrolet to veer into the turn 3 wall. Is it believed that the exhaust pipe area of the #88 car sliced the Goodyear tire of Jeff Gordon’s car to cause the incident. As an infuriated Gordon would finish 105 laps down at Bristol netting a 35th place finish, his teammate Dale Earnhardt Jr would see his top-5 effort go down the tubes due to a late-race speeding penalty. The #88 Chevrolet would limp around the Bristol Motor Speedway for a 15th place result. A race controlled early by Penske Racing’s #22 car, the #2 Miller Lite Dodge of Brad Keselowski would emerge to the front on lap 217. 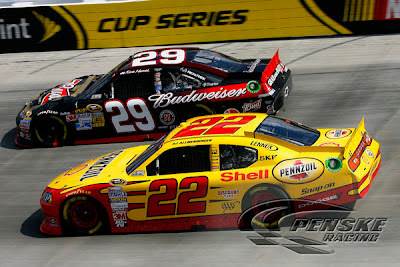 Narrowly averting involvement in the lap 24 accident, Keselowski was seeking an opportunity to win repeat Bristol races following his summer 2011 victory at the short track. Challenged by Matt Kenseth’s #17 Ford Fusion, the #2 Dodge survived a late race caution to triumph at the short track. Leading 232 laps of the Food City 500 (including the final 111 laps), Keselowski wins his first event in the 2012 NASCAR Sprint Cup season. 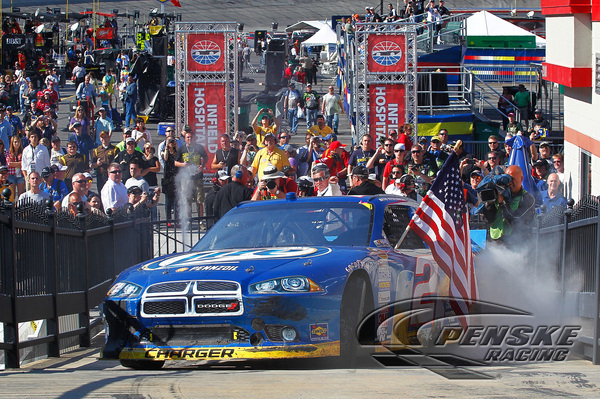 With Dodge entering the winner’s circle for this fourth NASCAR Sprint Cup Series race of the season, every auto company involved in the tour his won an event. Behind Brad Keselowski, the top-5 for the Food City 500 at Bristol Motor Speedway featured Matt Kenseth, Martin Truex Jr, Clint Bowyer and Brian Vickers.